In 1499, eleven year old Roberto encounters an erratic artist in the streets of Milan. The great genius of the Italian Renaissance, Leonardo Da Vinci (Brent Carver), is already a highly regarded painter but his keen mind, acute powers of observation and his insatiable curiosity lead him restlessly on to unlock the mysteries of nature.
. 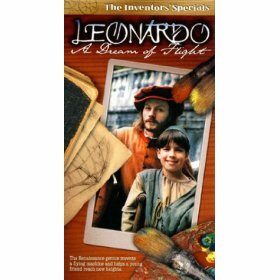 Together, Roberto ( David Felton) and Leonardo study winged creatures and turn their dreams to the conquest of the skies. Inspired by Da Vinci, Roberto allows his imagination to soar. If other of the earth’s creatures can fly, why not man? In this moving story of friendship, the Renaissance genius invents a flying machine and helps Roberto reach new heights. The year is 1499. In his Milan studio, Leonardo Da Vinci, dreaming of an infant being tantalized by a flying kite, is startled awake by his assistant Nicolo. Leonardo, Nicolo observes, has been burning the midnight oil again, filling his notebook with sketches and notes of a flying machine. In a Milanese marketplace, an 11-year-old boy named Roberto is trying not to let his malformed leg and crutch--or the protestations of his mother, Antonia, a birdseller--keep him out of a running game with his friends. Nearby, Leonardo is sketching the denizens of the market, when in fact he is supposed to be hard at work on a religious painting. As Nicolo admonishes his mentor, Roberto darts into view and collides with Leonardo, knocking painter and materials to the ground. Leonardo pretends to be furious and frightens Roberto’s playmates away, but he clearly knows the young boy and engages him in conversation as they head toward Antonia’s stall. There, Leonardo gently reassures her that Roberto’s free spirit is something to be nurtured--just like the small dove he buys and sets free. As he studies the bird’s graceful flight, he is met by Cecelia Gallerani, a beautiful young woman of Il Moro’s court whose portrait Leonardo is in the process of painting. Cecelia expresses concern for the future of Il Moro’s duchy. After doing his best to calm her fears, Leonardo buys more doves and heads for the countryside with Nicolo and Roberto. One by one he sets the birds free and sketches their flight, musing aloud about the wondrousness of their God-given freedom--and hinting that it is a soaring freedom he seeks to gain for himself. In Leonardo’s studio, Cecelia is again sitting for her portrait. As Nicolo assists him, Roberto peruses the many magical gadgets and inventions on display, most of them half-complete. His eye is soon drawn to a fantastic glider hanging from the ceiling. During a break, Leonardo explains that this is a half-sized model, capable of carrying perhaps a very small man--or a boy like Roberto. Before they can talk further, Leonardo’s benefactor Il Moro arrives to take Cecelia away. There is much on the Duke’ s mind, and he instructs Leonardo to come for a talk that evening. Later, as he helps his mother close her bird stall for the day, Roberto chatters excitedly about Leonardo’s flying machine. Antonia admits that if anyone might learn to fly, it would be a genius like Leonardo. Roberto wonders whether he might get the chance to become an apprentice to the great man. Antonia tells him not to get his hopes up. That night brings a spate of ill fortune. Il Moro breaks the news that Leonardo will not be permitted to complete the equestrian statue he has been working on for 15 years. The Duke, whos facing war with France, says he needs the bronze to make cannons. With this, his captain of the guard announces that French troops are massing on the duchy’ s border. Il Moro’s cavalry ride off into the night--but their route takes them on a collision course with Antonia and Roberto, who have finished their chores and are wandering home. Antonia is trampled and nearly killed. Taken to a monastery infirmary, fearing death, she asks that Leonardo--"the only one who cared for my son"--take the boy under his wing. Tragically, Roberto has gotten his wish. As the days pass, Leonardo and Nicolo help Roberto with the bird stall, and he helps them in Leonardo’s studio. Cecelia confides to Leonardo that Il Moro’s future looks increasingly bleak--and thus so does Leonardos position. Leonardo tries to help his patron by designing ever far-fetched implements of war--until Il Moro dashes his hopes once and for all. He will be surrendering his duchy to the French Kings ambassador, for whose upcoming diplomatic visit 10 days hence Leonardo must set aside everything and prepare a pageant. Ever loyal, Leonardo does as he is bid, but his frustration is palpable. At night he is haunted again by the dream of the baby and the kite. Roberto, too, is depressed to learn that his ailing mother has been moved to a convent outside the city. On a much-needed sojourn to the countryside, the maestro and the boy find common ground by talking about their mutual fascination with flying. But Antonias condition worsens--and Roberto snaps. He tries to set free the birds in her stall, until Leonardo intervenes, urging him to be as strong for his mother as she in the past has been strong for him. Il Moros meetings with the supercilious French ambassador, Grand Marshall Trivuzoli, have not gone well. He is counting on Leonardo, now reduced to "court artist," to lighten the mood with his pageant. But Leonardos show, based on Aristophanes play "The Birds," ends up enraging Trivuzoli, who sees himself caricatured as a vulture. He storms off, demanding Il Moro’s immediate surrender. The next day, the Duke acquiesces--and once more Leonardo is without a patron. As he begins to dismantle his studio, the maestro laments to his faithful servant that he is a failure, not least at the thing he most wanted to fulfill: the dream of flight. Nicolo and Roberto try to cheer him up, but Leonardo walks away, despondent. Faced with his hero’s crisis of faith, Roberto hatches a daring plan. Under cover of darkness, Roberto and Leonardo’s young assistants spirit away the glider that has hung from the rafters of the studio. At dawn, as they haul it up the slope of a nearby vineyard, the word gets out. Cecelia brings an urgent message to Leonardo: Roberto is going to try to fly! They rush to the site to stop him, but Roberto’s determination redoubles. Pushed by the assistants, the glider moves slowly, then faster and faster. Finally, with Roberto hanging beneath it, it takes flight--momentarily. The "bird" crashes to the ground, but Roberto, triumphant, arises unscathed. No one is happier than Antonia, who has been released from hospital and arrives with Nicolo to embrace her courageous son. The day arrives when Leonardo must move on in pursuit of a new commission. Antonia thanks Leonardo for taking such good care of her boy. Leonardo thanks Roberto for showing him that his wild dream was valid after all. Nicolo reminds him that the glider crashed--but already we see Leonardo figuring out how to make the next flight perfect. Leonardo Da Vinci was born on April 15, 1452 in the small town of Vinci, some 40 kilometers from Florence, the capital of Tuscany. He was the love child of a successful Florentine notary and a young woman about whom little is known other than her first name: Caterina. In his early childhood, he was raised by his paternal grandparents, and he might have followed in his father’ s professional footsteps had his illegitimacy not disqualified him from membership in the notary’ s guild. As it was, his youthful enthusiasm for the mysteries of nature had been cultivated by a beloved uncle, on whose farm he happily spent his formative years. At the age of 17 or so--largely self-taught, with a smattering of formal education at the hands of the local priest--Leonardo went to Florence, securing a position as apprentice to a prominent designer and sculptor, Andrea del Verrocchio, whose patron was Tuscany’ s ruling family, the Medicis. Over the next eight years, Leonardo learned every aspect of the artist’ s craft--from costume and set design for the Medicis’ many carnivals and celebrations, to architecture and mechanics for Verrocchio’ s commission on the city’ s Duomo, to metallurgy for goldsmithing and sculpture, to the myriad aspects of painting. (By all accounts a young man of extraordinary handsomeness, he may also have served as one of his mentor’ s models.) In 1472, Leonardo officially graduated from apprentice to master, but, strangely, he showed no impatience to make a name for himself. Finally, with Verrocchio’ s encouragement and blessing, he struck out on his own in 1478 with his first personal commission, a painting for the chapel in Signoria. Throughout his adult life, Leonardo was an obsessive chronicler, filling notebook after notebook with sketches of men, animals and machines, and thoughts written--from right to left--in mirror image. These books display a profound fascination, a blend of understanding and wonder, with everything under the sun: acoustics, anatomy, astronomy, automation, botany, hydraulics, mathematics, optics, physics--and, above all, flying. In a rare personal reminiscence he wrote of being mesmerized as an infant by the swooping of a kite, and as of the mid-1480s his notebooks reflected a growing fascination with flight, first that of birds, then of man-made contraptions. A reference in January of 1496 suggests he may actually have experimented with some sort of flying machine himself. This preoccupation is, of course, central to the film. Unfortunately, the turbulence of Italian politics over the last 20 years of Leonardo’ s life afforded him little peace in which to work. With the fall of Il Moro in 1499, Leonardo moved on again, returning to Florence and the court of Cesare Borgia (where he met and quite got along with Nicolo Machiavelli), before once again settling for life in Milan under French rule; there, King Louis XII honored him with the title "royal painter and engineer." At 61, he restlessly pulled up stakes and sought the patronage of Pope Leo X in Rome, where, famously, he debuted a mechanical lion that presaged the modern robot. But in 1516, in ailing health (he had partial paralysis of his upper torso), he finally settled for life in France; his last major (unfulfilled) project was to design a model city in the exact centre of the country. He died on May 2, 1519 at Cloux. Twice in his life, Leonardo had taken on young proteges--the first in 1490, a 10-year-old Milanese boy named Giacomo Caprotti, whom he nicknamed Salai (Tuscan for "demon," since the boy was reportedly a handful), the second in 1505, a 15-year-old Florentine named Francesco Melzi. He remembered both in his will, leaving Salai a house and half a vineyard, and naming Melzi executor, leaving him, among other things, all of his notebooks, which numbered some 13,000 pages. Unfortunately, more than two-thirds of these precious artifacts of genius have yet to be found. 1893 Menlo Park, New Jersey...Thomas Edison - the world’s greatest Inventor - is alone in his lab, obsessed by a vision: "What if I could do for the eye what my favorite invention, the phonograph, does for the ear?" Galileo is on the verge of uncovering some of the mysteries of the universe but has to deal more with mundane problems as well; money, an idle, unemployed brother and a jealous rival. He finds support from an unexpected source, the pampered son of the powerful Medici family. Toward the end of a brilliant career in 1954, Albert Einstein (Paul Soles) was arguably as famous a media figure as he was a scholar and physicist at Princeton University. . .